The API Compliance Institute was founded on 19 December 2002. 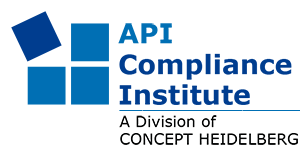 The basis for the activities of the API Compliance Institute is constituted by a contractual agreement between APIC, a sector group of CEFIC, and CONCEPT HEIDELBERG. It is the mission of the API Compliance Institute to standardise GMP audits of API manufacturers and to minimise the costs of compliance Audits. To represent the interests of that part of the industry engaged in the manufacture of pharmacologically active ingredients and intermediates. To be the recognised forum for the industry to address relevant issues. To be the recognised voice of this sector with the competent authorities. APIC Audit Programme Starts in 2003! On 19 December 2002, the APIC Auditing Programme was launched. Dr L. Hartmann from F Hoffmann-La Roche, Vice Chairman of APIC, and O. Schmidt, managing director of CONCEPT HEIDELBERG, signed an agreement of co-operation. The APIC Audit Programme is a standardised "Third Party Auditing" model. Its aim is to offer an independent and recognised GMP compliance audit of API manufacturers and/or distributors, including organisation, conduct and evaluation of the audit. The resulting audit reports can be used by Qualified Persons of pharmaceutical companies within the framework of supplier qualifications. In this way, API manufacturers and pharmaceutical companies can reduce their auditing costs. At the same time, they can rely on standardised audits of high quality.